Tryon Palace was originally built between 1767 and 1770, as the first permanent capitol of the Colony of North Carolina and a home for the Royal Governor and his family. Governor William Tryon had brought John Hawks, an English architect, with him when he came to North Carolina in 1764. Hawks designed the Palace in the manner of a number of fashionable houses in the vicinity of London-- Georgian in style, with symmetry maintained throughout. It was soon regarded to be the finest public building in the American colonies. Josiah Martin, the second royal governor to live in the Palace, fled in May of 1775 at the beginning of the American Revolution and his furnishings were later auctioned off by the newly formed state government. Patriots made the Palace their capitol and the fist sessions of the General Assembly met there to begin designing a free and independent state. Four state governors used the Palace: Richard Caswell, Abner Nash, Alexander Martin, and Richard Dobbs Spaight. 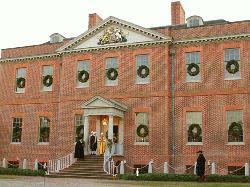 On the evening of April 21, 1791, the Palace was the scene of a dinner and dancing assembly held in honor of President George Washington, who was visiting New Bern while on his Southern Tour. Raleigh became the state capital in 1794. Space in the Palace was rented for various purposes, including a Masonic lodge, a private school and a boarding house. In February of 1798, fire started in the cellar, where hay was being stored. The fire quickly devastated the main building, which collapsed, but the Kitchen and Stable Offices were saved. The Kitchen Office was demolished in the early 19th century; the Stable Office survives. In the 19th century George Street was extended over the original Palace foundations and dozens of houses and businesses were built on either side. At the end of the street, a bridge crossed the Trent River. In the 1930s a movement began to restore North Carolina’s first capitol. The movement gained strength when volunteers tracked down John Hawks" original architectural plans. In 1944, Mrs. James Edwin Latham, a Greensboro resident and native of New Bern, challenged the State of North Carolina to join her in restoring the Palace. She guaranteed her commitment through establishment of a trust fund dedicated solely to the Palace restoration. In 1945, the legislature created the Tryon Palace Commission, a body of 25 persons appointed by the governor, and charged it with the reconstruction of the original Palace from its original plans on its original foundation. As part its commitment, the state further agreed to maintain and operate the restoration when it opened to the public. The furnishings at the Palace are primarily English. Governor Tryon made a very detailed inventory of his possessions following the destruction by fire of his later home at Fort George, New York. This inventory, which revealed the Tryons" taste in furnishings, was used as a guide in refurbishing the reconstructed Palace. Hours of Operation: Dixon and Stanly houses: open for self guided tours from 1-5pm* Hay House: open 11am-5pm First palace tour: 9:30am Kitchen office opens at 9:30am Visitor Center and grounds are open to the public at 9am. Dixon and Stanly houses are open for self-guided tours every day except at *3pm, when guided tours are available.